The title of this post, the name that I will remember it by, says it all. It was a good trip, certainly different from our other trips. Much less wind, much more rain. Moisture might be a better word than rain. Moisture in the form of fog, light misting, steady drizzles, and heavy downpours. Blue skies made one appearance in the first four days. It was not the weather that I had expected, it was not the kind of sailing I had been dreaming about. 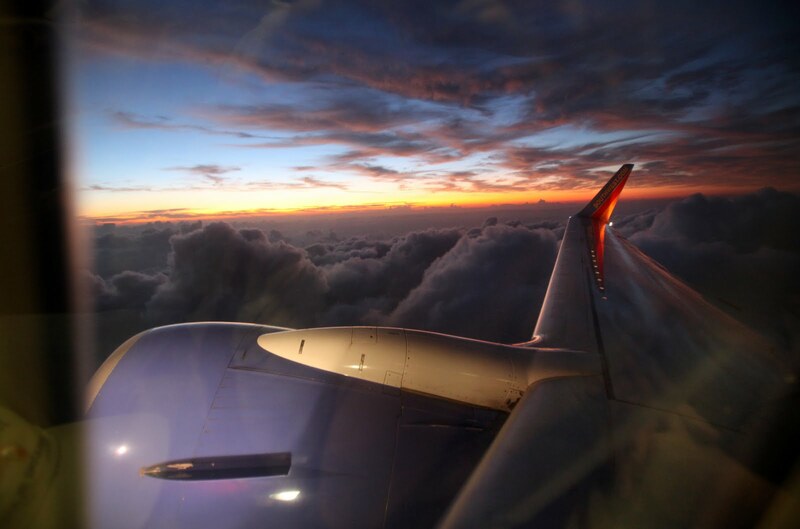 But it was the break I needed, the chance to get away from it all and experience something different. As I drove home today I found myself wishing I was still out on the water. I'll try to post a few photographs this evening, or certainly by tomorrow. Bad weather, as photographers sometimes say, can make for nice photographs. We'll see. And I hope to start the daily log by early this coming week. 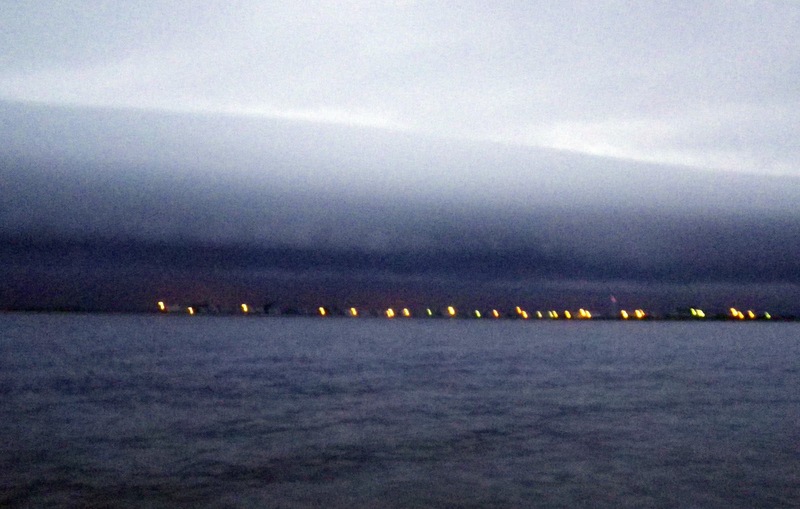 Storm rolling over the bay this afternoon. 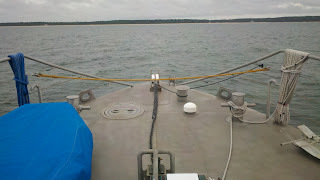 Out on Chesapeake Bay today, for work and not for fun. But it is kind of nice out here. Here is my SPOT tracking page. ..............into your browser. It should go live late Saturday morning. 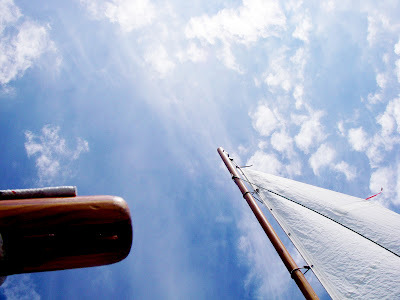 I'll send an ok message when I begin each day's sail, and send a second ok message when I drop the anchor in the evening. Long day of work today, long day of work tomorrow. Then I'll load up the jeep, try to get a good night's sleep. Breakfast at Stingray's (Chez Exxon) on the way to Crisfield Saturday morning. Best wishes to my friends Paul, Dawn, Alan and Kristen for the NCC watertribe event. Check it out here if you have a chance. I've started moving some of the gear and supplies out to the garage. There it is set out in position similar to how it will fit in Spartina. Most of it will disappear beneath the decks, thwart, aft cockpit seats and coamings. The Pathfinder is an easy boat to pack. This is not everything. Some of it is in the boat right now - the fishing tackle, some safety gear, navigation gear, etc. I'll sort through that next. I'm getting two different forecast right now, not unexpected three days out. WeatherUnderground shows six to seven mph of winds out of the north with a good chance of thunderstorms. 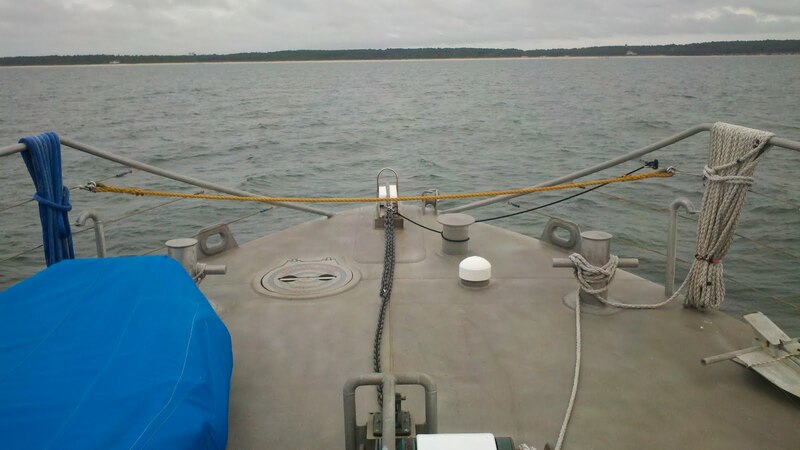 SailFlow, below, shows winds up to 13 mph out of the south with cloud cover but no rain. The weather will be what it will be, but I like the Sailflow outlook on things. As Bruce has said on a couple of occasions, "We're going anyway." I packed the clothes this morning, bought my Virginia saltwater fishing license on-line (it works for both Virginia and Maryland waters), pulled a couple of items that I won't need - spaghetti and an extra pouch of instant mashed potatoes - from the food jars and also found my wasabi seaweed snacks which I had lost somewhere in the pile of equipment. I'll start moving the gear to the garage tomorrow. This coming trip will be a walkabout style trip. An easy, relaxed exploration with no specific goals. I've got a rough idea of wanting to head north the first few days. 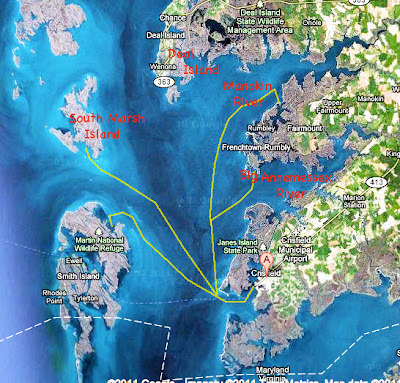 Maybe explore Deal Island, Fishing Bay and possibly visit the little town of Bivalve. Then head south, passing by Holland Island or maybe South Marsh Island, stopping at either Tangier or Smith Island for a crab cake sandwich, then continuing south to Pocomoke Sound, Watts Island or Great Fox Island and maybe Saxis. 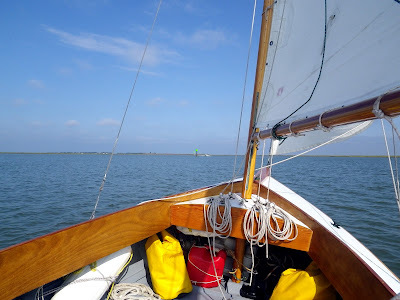 Then back north, possibly anchoring in Cod Harbor on Tangier Island, and maybe another crab cake sandwich for lunch, before heading back into Crisfield. 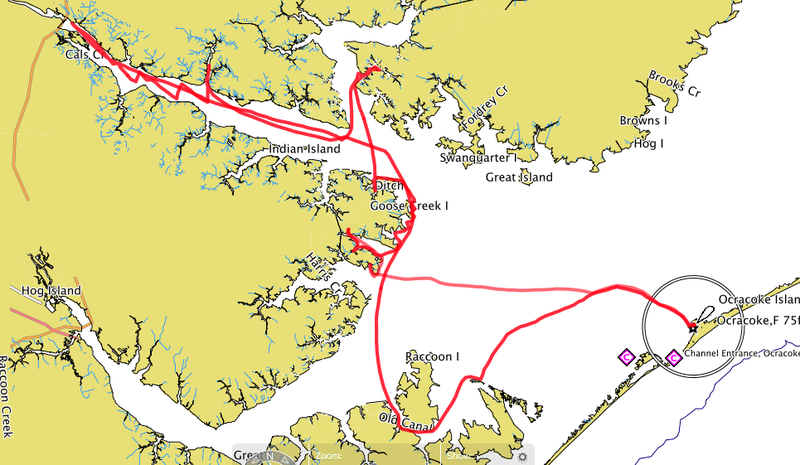 The only specifics in the plan I have is to launch out of Crisfield, then eight days later return to Crisfield. What happens in between? Wind and whim will decide that. 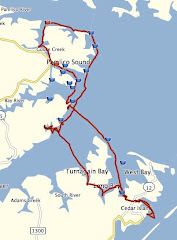 The nature of the area - countless coves, marshes and protected anchorages - lets me be a little loose with the planning. If I want to head north the first day, I will have plenty of options. 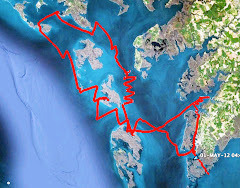 Above I've marked out just a few of possible routes and anchorages for day one. I've visited some of those places, others I have not. For each possible anchorage I've marked, there are a dozen more. 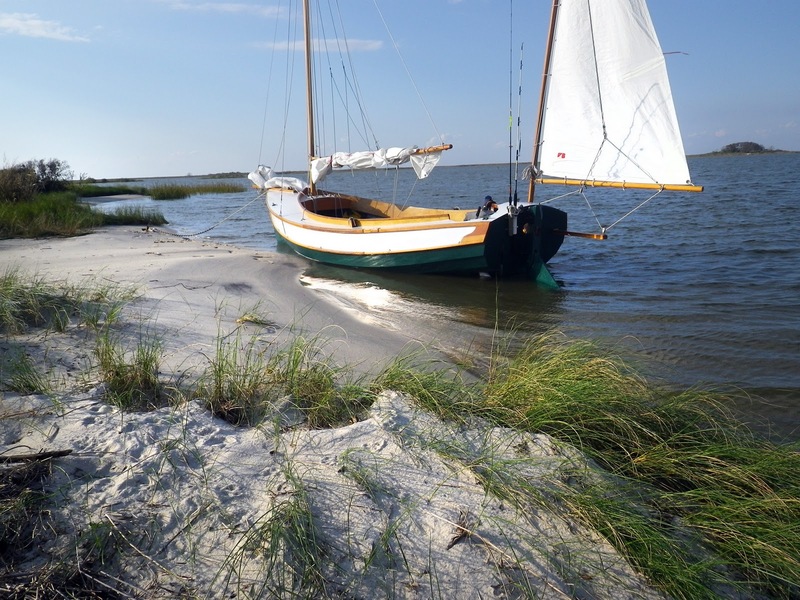 Finding a place to anchor, protected from the wind and surrounded by a beautiful marsh, will not be a problem. 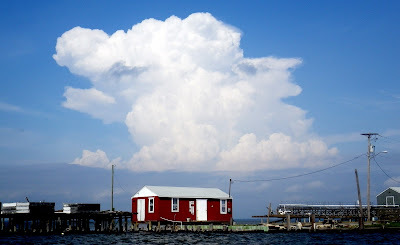 I'll start thinking about where to go that first night as I rig Spartina in Crisfield. The weather radio will be on and the wind forecast will give me some ideas. 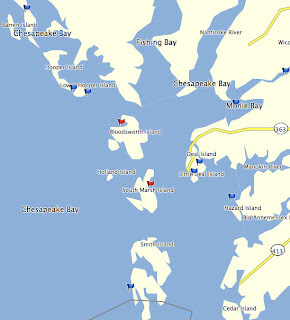 But I probably won't make a final decision until I'm out on Tangier Sound. Then I will go with whatever feels right. Curiosity got the best of me and I peeked at the forecast weather fronts. Five days our the forecasts are less than realiable, but it gives me something to think about. 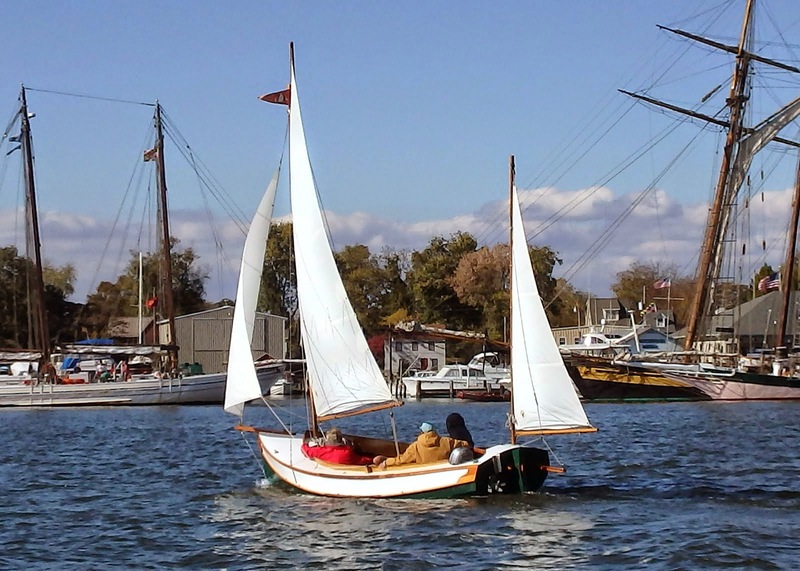 I can't even begin to hope for the weather like I had last fall on the Bay Days sail - sunny, breezy and not a drop of rain. That won't happen again. 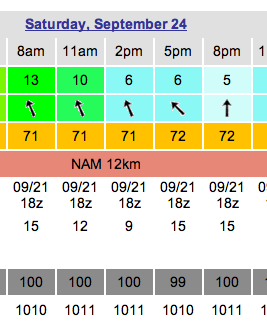 Above is the forecast for the day I should be launching out of Crisfield. A little low pressure system should be over the lower part of the bay. 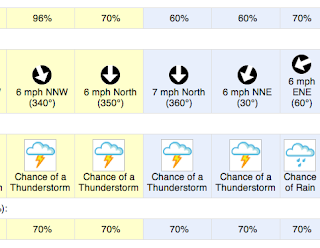 Chance of rain, anywhere for 10 to 40%. No big deal. 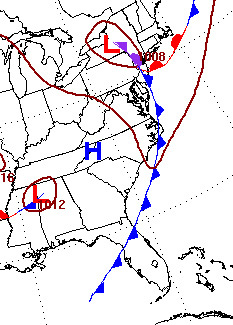 Thank another small low pressure area could move over the mid-Atlantic a day or two later. 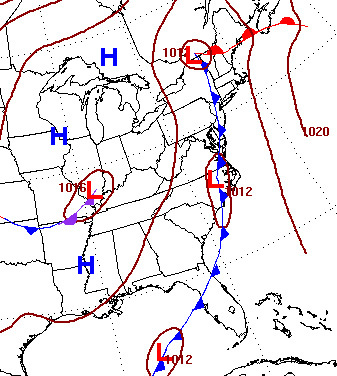 By early next week a series of high pressure system will be moving across the country. The first couple of days the trip might be a bit bumpy, a little wet. But after that I'm hoping for some nice weather. I got a fair amount of work done today. Food is tucked away in storage bottles, sleep gear has been stuff into stuff sacs, extraneous gear has been removed from the light and cooking kits, two gallons of fuel was put into the gas tank along with the two-stroke oil and fuel stabilizer and I added new batteries into the lights, flashlights, gps and spot. I still need to add a few more waypoints to the gps, I'll do that tonight. The shopping list is less than I expected. Crackers, rubber gloves, propane for the stove and the lighter. 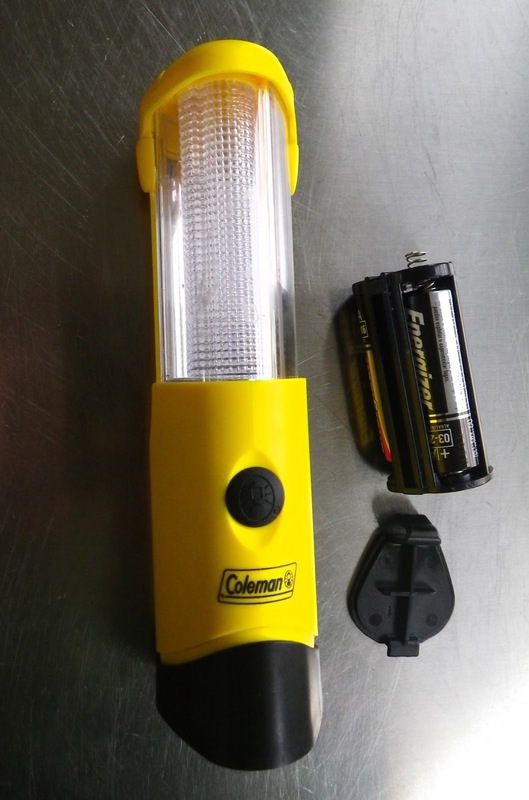 While checking out the gear I found that my spare anchor light, a colemen camp lantern, no longer works. It looks like some salt water got in there. This surprises me because I have used this backup light very rarely, it stays in the light kit which has always stayed dry. The one that I use every night, the one that has been through many rain storms, works just fine. Go figure. I'll pick up a new one for less than $10, along with the items mentioned above, at my local expedition supplier - Walmart. Tomorrow before work I'll do the shopping. Wednesday I'll spread out the gear and do junk on the bunk. Friday morning I'll pick up the fresh food - potatoes, onions, garlic and peppers. Today is my day to start packing, sort things out and do some shopping for my on Tangier and Pocomoke Sounds. I bagged up the dried kiwi and papaya, mixed and measured the wasabi edamame and mixed nuts. 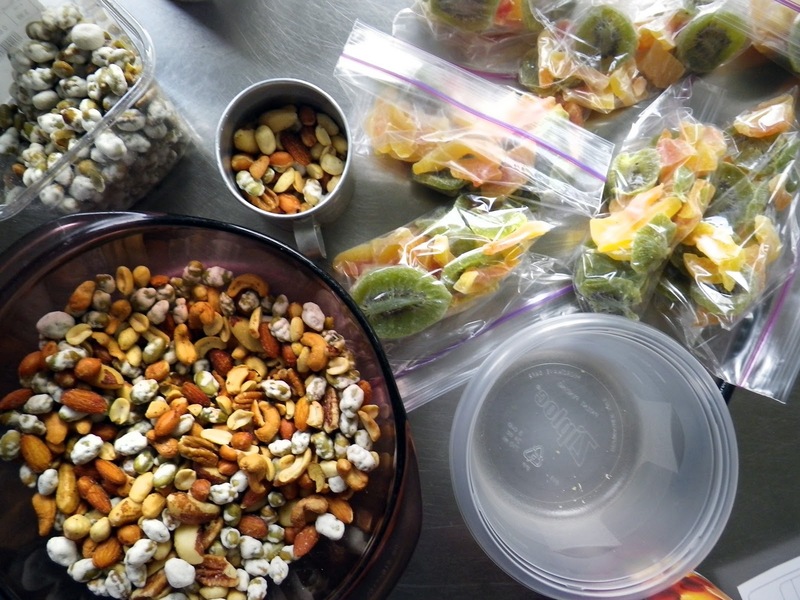 Each snack measures roughly 3/4 cups, there are seven bags of each. 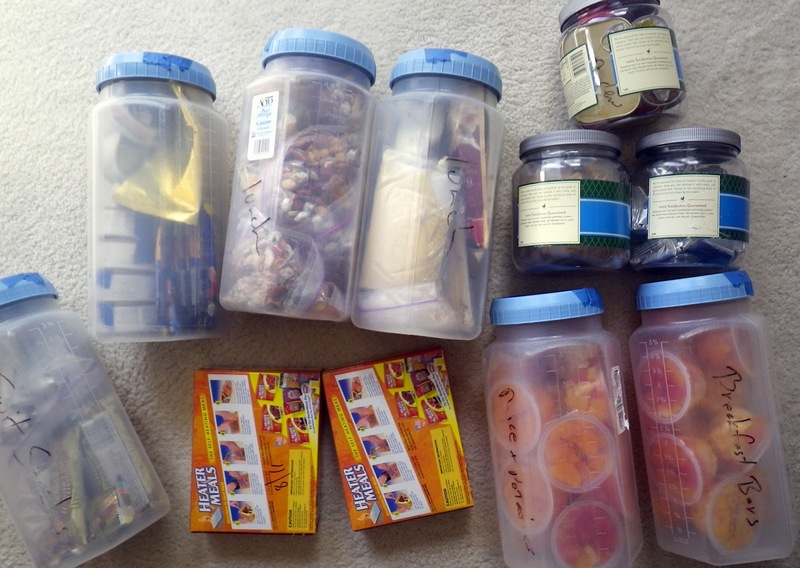 I put the canned lunches, dinner supplies and cups of fruit in the gallon jars. I had at one time labelled the jars on the sides and also on the top so that I would know the contents. And then I realized the jars were clear and I could see inside, no need for any labels. Simpler is better. 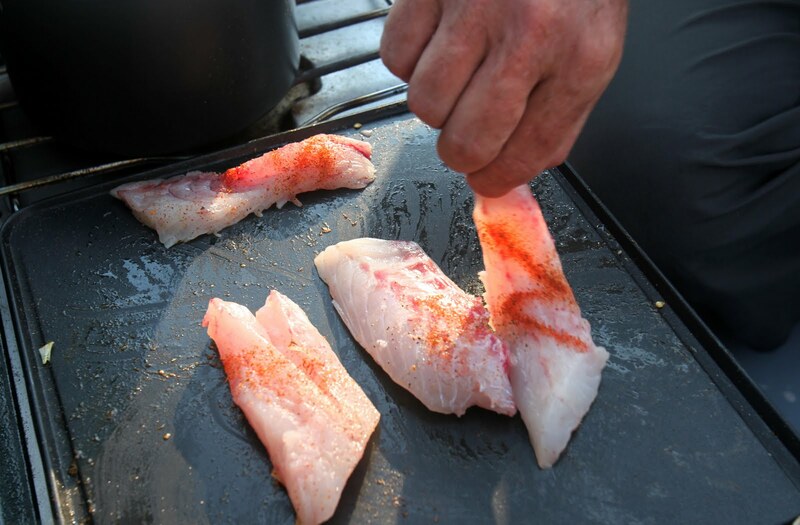 I field stripped the MSR cookware set that Bruce bought for the boat a couple of years ago. It is designed for two people, perfect when we are both on the boat, perfect for the feasts that Bruce likes to prepare and I like to eat. But I'm solo and need just one set. I'll leave behind a set of silver ware, the extra pot and an additional pan. My cooking is very simple, I just need a pot and the stove's griddle. The system is light to start with, now it is lighter. 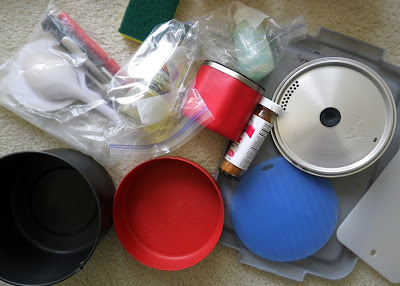 Plus there fewer cookware items to keep track of, to use, to wash. Simpler is better. Have I said that before? 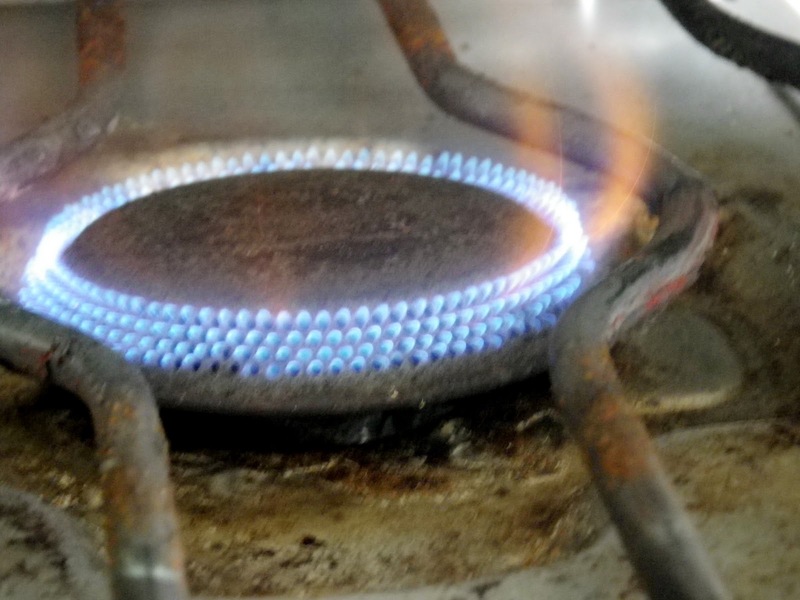 I set up the camp stove and lit up the burners. The camp stove, which has a burner for a stove and a burner for a griddle, worked fine but I realized that I needed to buy a set of propane canisters. I've added propane to my shopping list that includes peanut butter crackers, rubber gloves (that I use for cleaning fish, which I hope happens often, and working on the outboard, which I hope never happens), gas for the outboard, spark plugs and and a spare lighter for the stove. The list will grow as I sort through the gear. 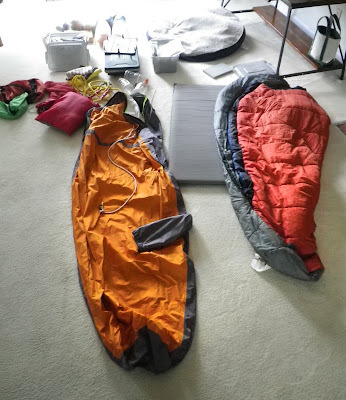 The sleeping gear was brought out of the spare closet upstairs and I felt I tug of regret as I pulled out just my set and left Bruce's gear behind. I'll miss his company. There is still a lot to do. Packing, shopping, checking gear, researching my new sailing grounds, rearranging the boat for cruising as opposed to daysailing. At some point I should check the weather. But that will have to wait for a couple of days. The eye in the sky satellite is of little use today with heavy cloud cover over much of Chesapeake Bay, but I have no doubts that the silt is moving south. 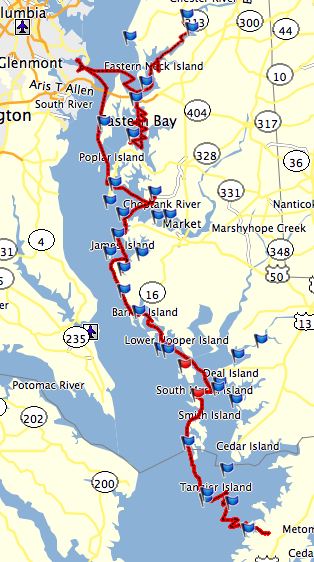 I've decided to avoid the main part of the Bay, exploring Tangier and Pocomoke Sounds and a few rivers to the east. We've sailed past a lot of the places in the past, never stopping to look around. As I look over the charts and google earth I find I'm pleasantly surprised by the new sailing grounds. Going north from Tangier Sound the Nanticoke River and Fishing Bay have caught my eye, two bodies of water surrounded by marshes, wildlife refuges and not much else. Fishing Bay (let's hope they call it that because of the great fishing) is a wide, shallow bay that would offer several good anchorages and a pristine shoreline. Depths are marked at mostly three and four feet, plenty of water for Spartina. At the very north end is the Transquaking River, a river worth visiting just for the name. 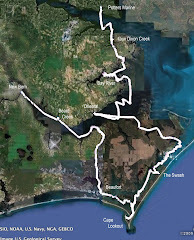 Here is a map showing some of the area. 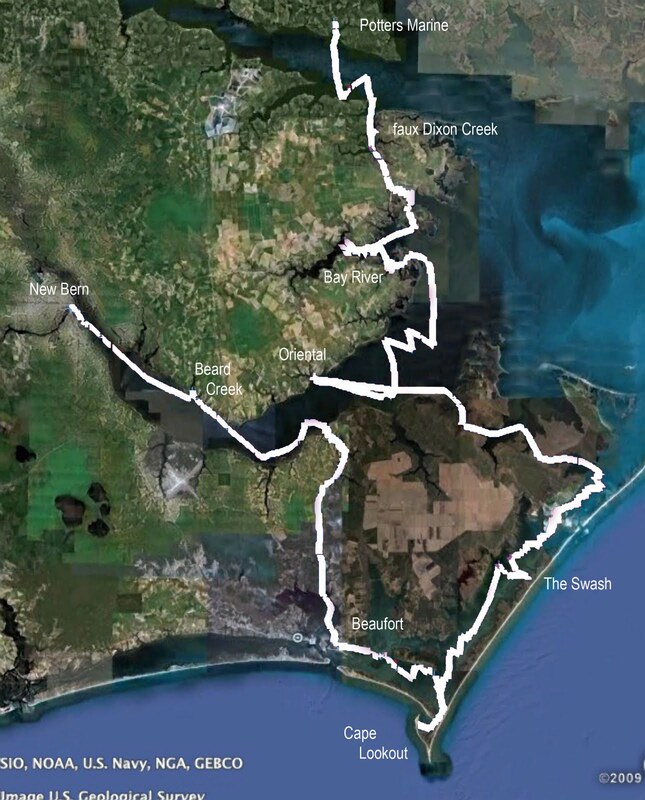 The Nanticoke River, with deeper waters than Fishing Bay, has wildlife refuges on the western shore and a couple of communities, Nanticoke and Bivalve, on the eastern shore. There is not much information about the villages available on the web. Each has a marina, Nanticoke has a boat ramp. What else is there? I don't know. I might sail in and find out. 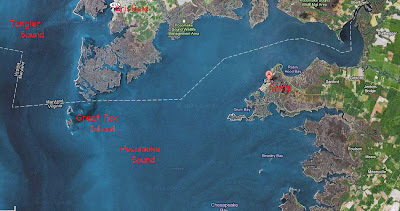 South of Tangier Sound I would like to visit Pocomoke Sound. 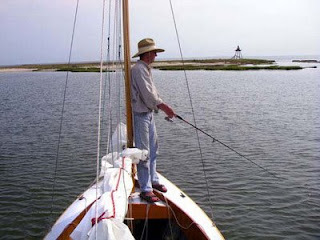 Bruce and I sailed across the southern edge of Pocomoke Sound last spring on our way from Onancock to Tangier Island. 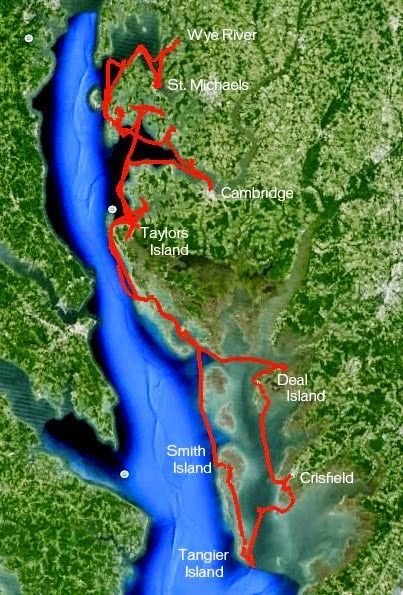 And I was on the western edge of the Sound when I visited Great Fox Island in 2007, above, on my first cruise with Spartina. Pocomoke Sound separates Maryland from Virginia, you can see the state line running across the water in the sat photo below. Apparently there was a history of fighting over the fishing and oystering grounds in the area in the 1700's. 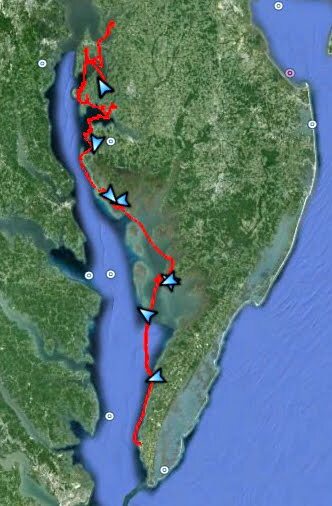 Years ago I read The Oyster Wars of Chesapeake Bay and, though I don't remember the specifics of the book, this area had to be one of the main battle grounds for the war. Saxis is the only community on Pocomoke Sound. I have never been there by land or water, so that is a place I would like to visit. 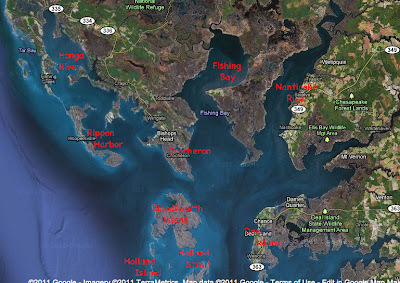 From google earth it reminds me of the villages of Tangier and Smith Islands, a crabbing community with a working harbor, a church, rows of shedding tanks for soft shell crab and a scattering of homes. And a restaurant - The Marshtump Cafe. What a great name. 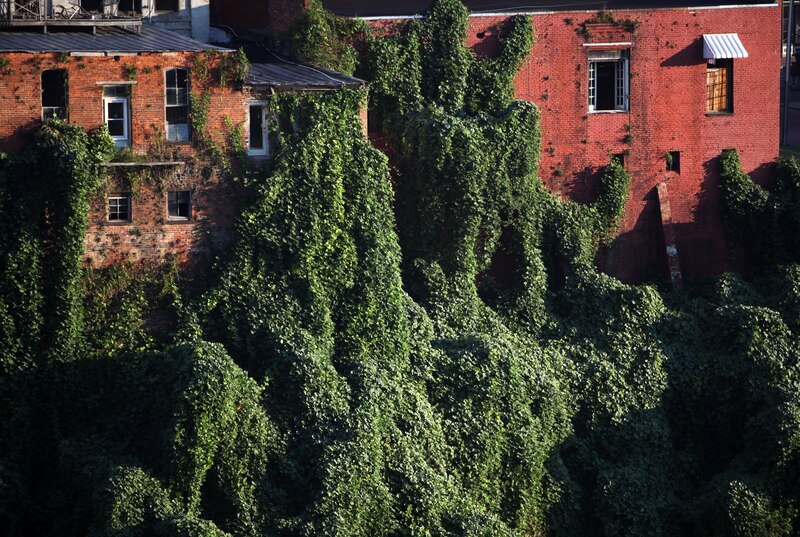 It sounds like the setting for a short story. The cafe, which appears to be in or next to a crab picking house, is definitely on my list of places to visit. I had forgotten about the oyster wars book, recalling it only as I wrote this post. I just went to the book shelf and was very happy to find it there, covered with a thin layer of dust. I had read it years ago, before Spartina, before ever sailing on the Bay. I don't recall the specifics of the book, it may as well be a book I have never read. I'll take it along with me on the trip, it will be fun to read about the history as I sail over the traditional oyster grounds of the Bay. The trip is a week away with just one day off from work to get ready. That will be a busy day, a fun day. Papaya slices with lime juice, edamame wasabi and kiwi slices. About twelve bucks at the Fresh Market. I'll mix the papaya and kiwi with banana chips and maybe some mango. The edamame will be added to some mixed nuts and raisins. I just found this NASA eye in the sky site through the Maryland Department of Natural Resources. You can easily see the silt moving down Chesapeake Bay. 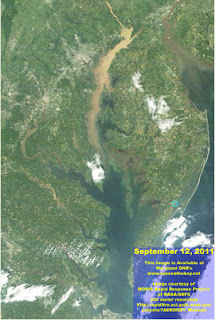 The top photo is from September 12, the silt is off of Taylor's Island. The bottom image is from two days later, September 14. 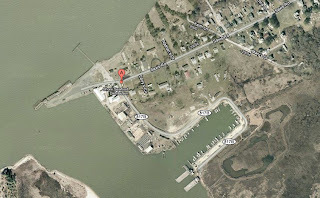 The silt has moved down to mid-Bay between the mouth of the Potomac River and Smith Island. Mid-Bay the silt does not appear as dense (not sure if that is the right word for it), but it is definitely there. 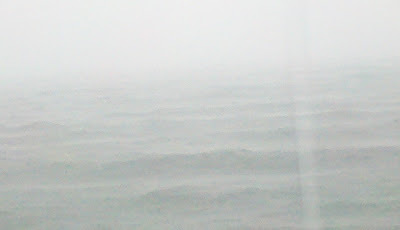 The silt appears to be moving past Tangier Sound, but I suspect the tides are pulling a little bit in past the islands. 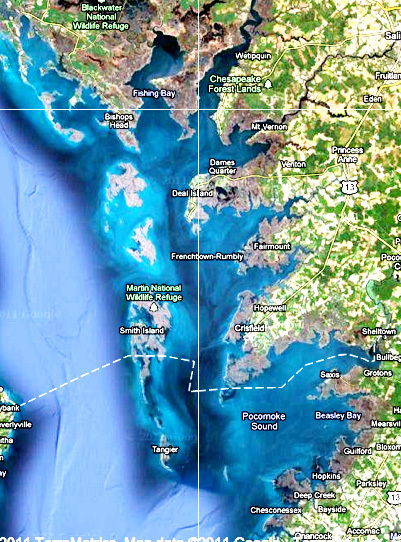 Plan B - the Honga River, Tangier Sound and Pocomoke Sound - might be the way to go. 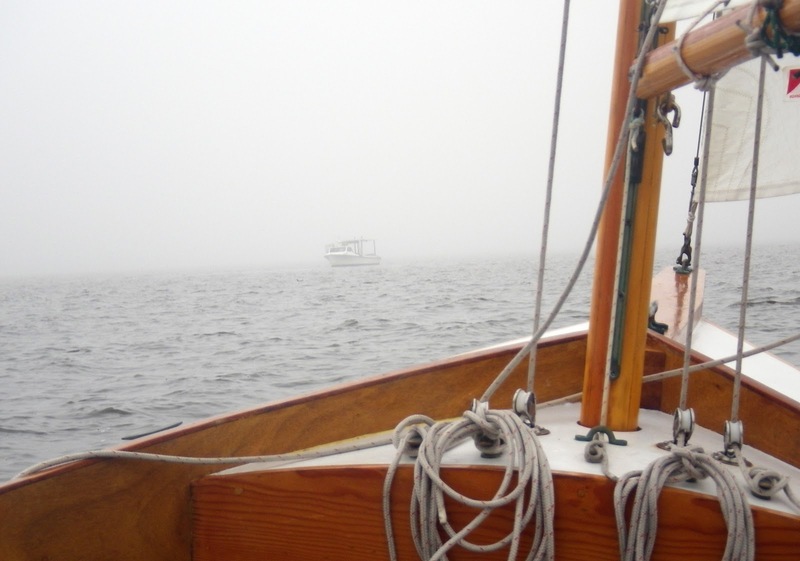 I sailed to the edge of Pocomoke Sound a few years ago, anchoring at Great Fox Island. I need to research the area tonight. Right now all I know is that there is a town called Saxis with a restaurant called the Marshtump Cafe. Sounds interesting. "Swollen by rainfall first from Hurricane Irene and then Tropical Storm Lee last week, the surging Susquehanna sent enough fresh water into the bay to completely replace all the water in it, according to Mark Trice of the Department of Natural Resources. 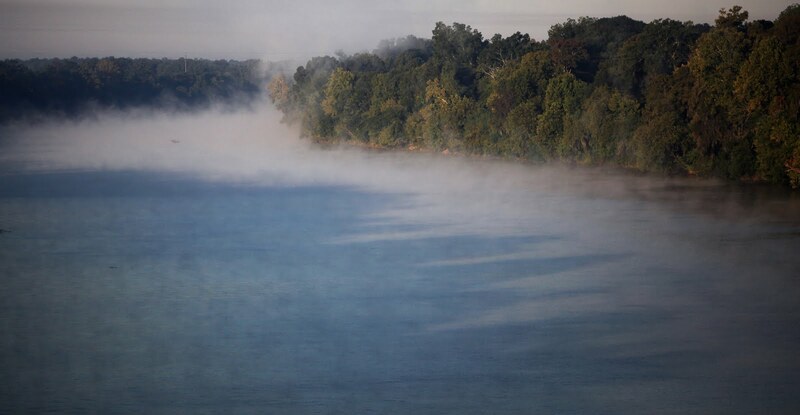 The USGS also estimated that the roiling Susquehanna scoured 4 million tons of sediment trapped behind Conowingo and other dams on the river and carried them downstream." 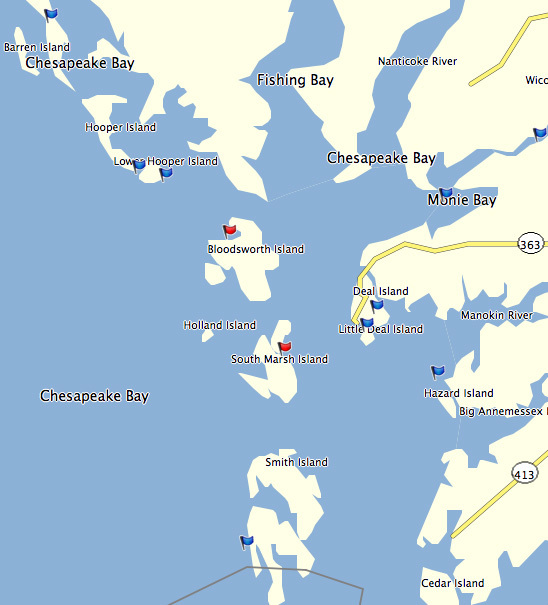 Chesapeake Bay does look like a mess right now. There is more to be concerned about than just a sailing trip. This could affect the bay for a long time to come. Sediment muddies the water, blocks the sunlight and inhibits the growth of subaquatic vegetation. Those seagrasses should be home for juvenile crabs, fish, etc. The nitrogen flowing into the bay in the form of runoff is a fertilizer that allows algae to grow, again reducing clarity and impacting the SAV's. 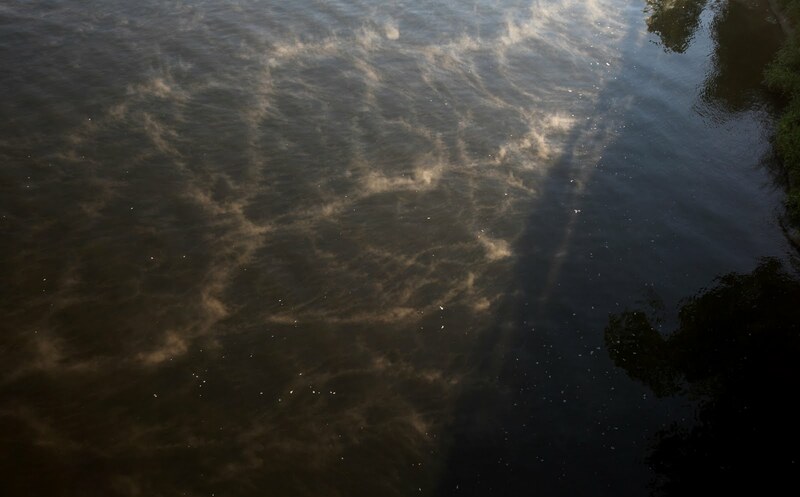 Sediment, fresh water, algae blooms are all bad for the bay. Fish, oyster and crab populations could all suffer. As for the trip, I'm following the news and will make a few phone calls before setting off on the cruise. I did find this satellite photo on the Maryland Department of Natural Resources web page. 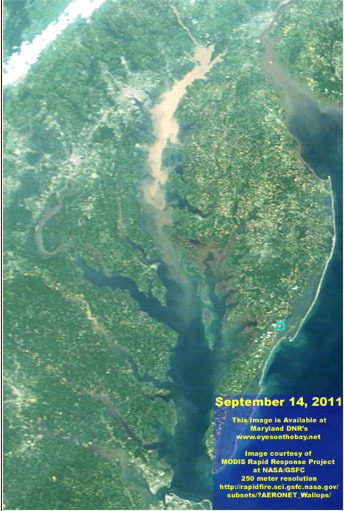 The visible runoff appears to reach the narrow stretch of the bay between Cove Point and the very upper part of Hoopers Island. 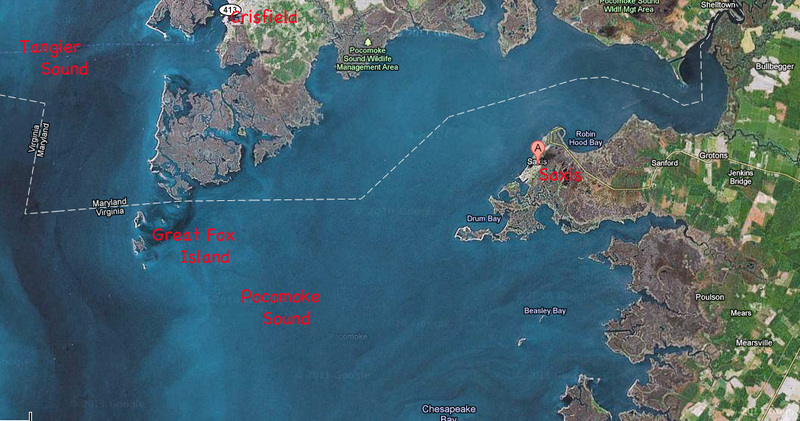 I've marked my sailing area in red. 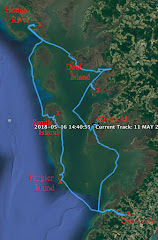 The only overlap is, according to this photo, from Fishing Creek north to James Island at the mouth of the Little Choptank River. 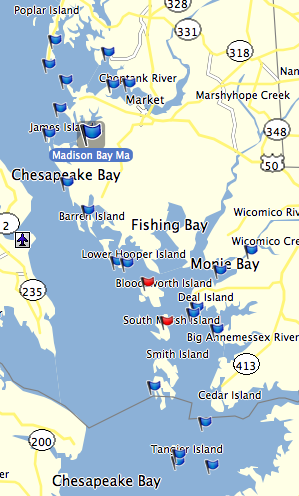 The runoff does not seem to be entering the Choptank Rivers. Hopefully it will stay out of Tangier Sound too. Maybe I'll adjust my plans and sail the Honga River, Tangier Sound and Pocomoke Sound down to Onancock. Thanks Kevin and Mary Lou for the updates, I appreciate the information. I'm checking my waypoints this morning before going into work. 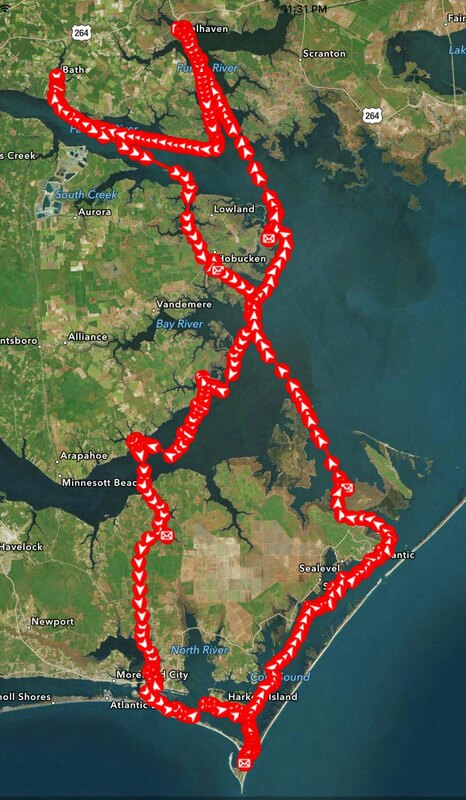 The waypoints that I have on the Garmin gps from the spring trip cover all of the area I'll be sailing. 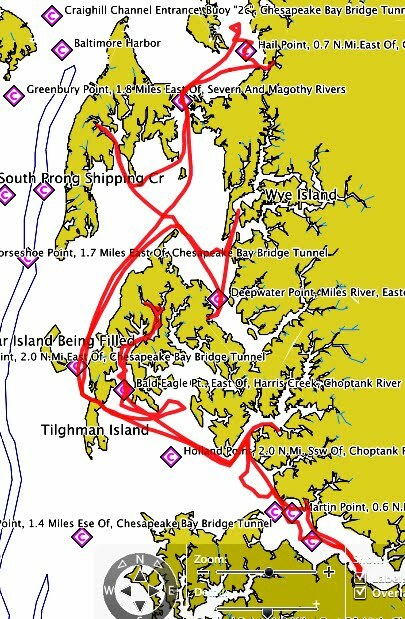 The screen shot below shows my fall cruise area from Tilghman Island at the north end to Tangier and Watts Islands at the south end. 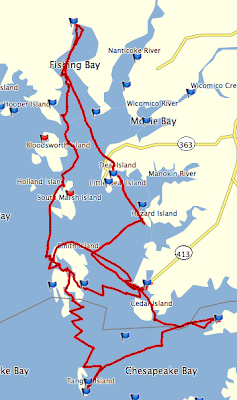 There are some additional places I need to add to the list such as Solomons Island (near where the airport is marked half way down the map on the left) in case I decide to cross over to the western shore. 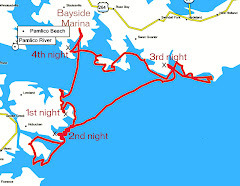 On Tangier Sound I need to add Crisfield, the starting and stopping for the trip (though I'm reconsidering using Rumbley, just to the north, instead). 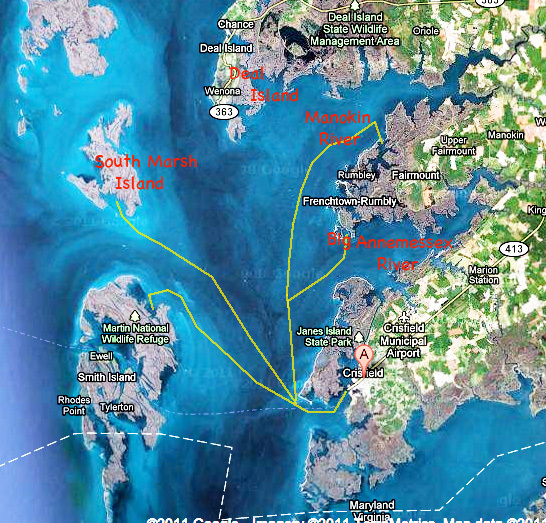 And I want to add some more waypoints for entrances to the waterways on Smith Island, South Marsh Island and Holland Island. I've got the islands marked, but finding those narrow marsh-lined entrances can be difficult from water level. So I'll add marks on the eastern and western sides of Smith Island and the north end of South Marsh Island. 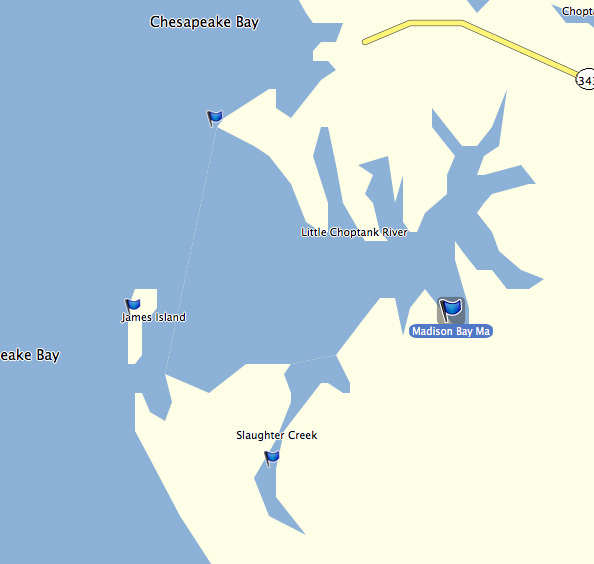 Below is the Little Choptank River. Bruce and I visited Slaughter Creek last Spring. This time I may go back into the river a little bit more. Madison Bay, Fishing Creek and Solomons Cove might be fun to explore, plus they all offer excellent anchorages. I need to research that area on google earth a little more. 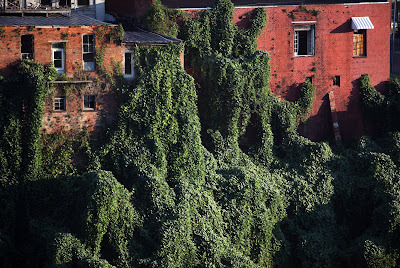 In the past 24 hours I have received two emails about debris in the water left over from Hurricane Irene. 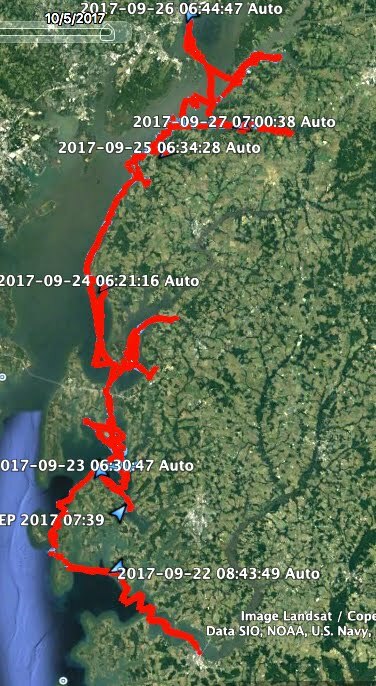 Paul, who is gearing up for the Watertribe's NC Challenge, described his sailing area in the sounds of North Carolina as a "debris field." He says all the missing docks must be floating around out there somewhere. And our friend Mary Lou from Rock Hall sent a note about trees, parts of houses and propane tanks floating around on Chesapeake Bay. I'm hoping that debris won't be a problem on Tangier Sound, the Honga River and the Choptank Rivers - but I will certainly keep an eye out while sailing. The work schedule is busier than I like, but I've got all day Monday clear to check gear, run errands and pack up. 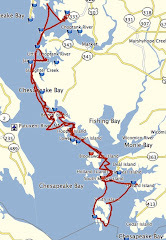 And then a few more days of work before heading to the Eastern Shore. Back home late last night. Finally. It was an interesting trip to the Deep South. Good to be home. Now I need to start checking gear for my sailing trip just about 10 or 11 days away. Lots of details are on my list. Right now I'm checking on clothing. That is the bottom inside corner of my Northface convertible pants back pocket. 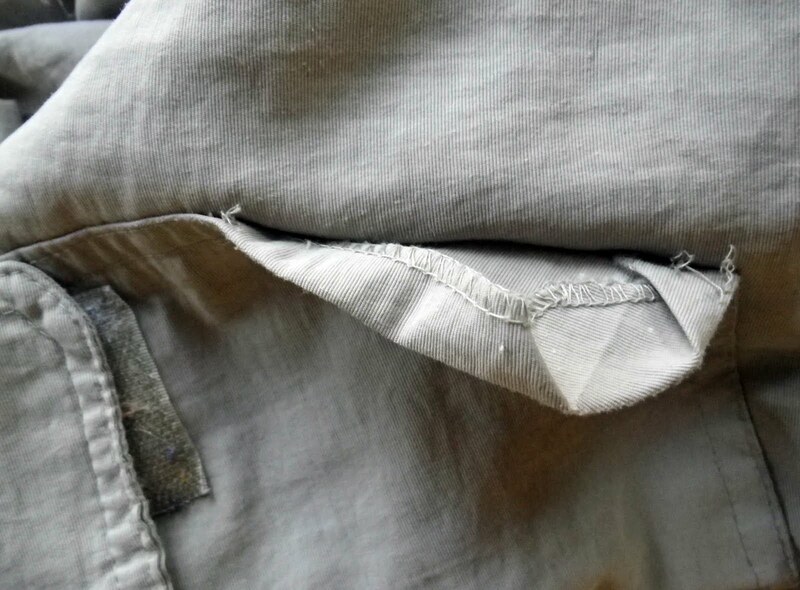 The inside corner of both rear pockets had torn loose like this. I called Northface and they said send the pants back, they will resew them for me. They will probably come back stronger than when they were originally made. Unfortunately the turn around time for the service is a little over four weeks so I cannot get it done before the trip. Which is fine. I don't carry anything in my pockets when sailing. But I will send them back in the winter and have the work done. They are good pants, we'll worth the extra money paid for them. I bought, with some birthday money from my Mom (thanks Mom), a third long sleeve Grande Banks Nylon Shirt for this trip. I would have said the new shirt is light orange, the tag says it is "coral." I have bought all the shirts at the Bass Pro Shop, about $30 when on sale. They are comfortable, quick drying and block the sun. I also have a couple of short sleeve shirts like this for day sailing, but prefer the long sleeves for cruising. While spending 12 hours out in the sun I want the protection of the long sleeves. Not only do I keep the sleeves rolled down, I also like to turn the collar up and button the top button. I enjoy the sunshine, but at times in can be brutal (not to mention unhealthy). With two pairs of pants and three long sleeve shirts I am in good shape. I'll also carry some tee shirts for in the evening when it cools down. Bruce will like this. 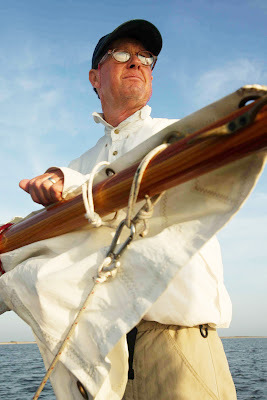 He has always given me a hard time about the eye-glass retainer that I use when sailing. It has been, for the past several years, a foot long piece of pink nylon line, the kind surveyors tie between sticks pounded into the ground at construction site. Bruce says they look ridiculous. He is right. But they were cheap and they worked. He threatened to buy, and maybe did buy on one occasion, a proper eye-glass retainer for me. If he did buy a pair they are sitting unused somewhere in the box of sailing gear. I just never found a design that looked comfortable to me. While shopping at Bass Pro Shop for my shirt I came across the Chums Mono-Orbiter retainers, part of their tech line. That is a pretty big name for something to hold my glasses. 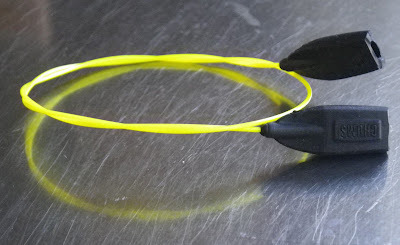 But I liked the design, particularly the brightly colored monofilament, and bought a pair. 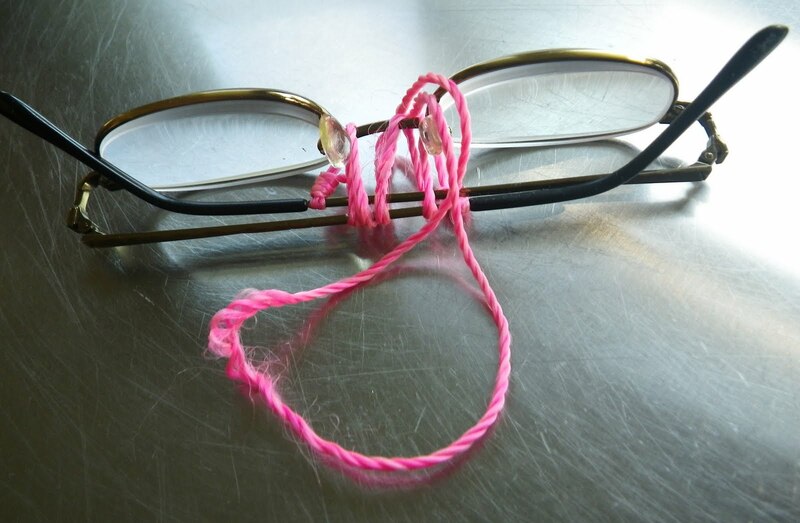 Bruce, you will be glad to know that the pink string has been retired, at least for my regular glasses. My reading glasses, used at night, will still have the pink string on them. 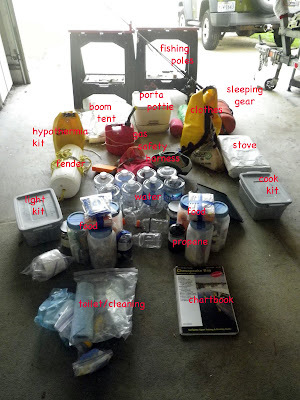 Our sailing equipment checklist has for years been a print out of the Watertribe's required equipment list. That .pdf, as far as I can tell, is no longer on the watertribe site. I've used the one copy I have on several trips, it is getting to be a mess as I use a different notation - sometimes a check mark, sometimes a dash, sometimes a circle - to check off items for each cruise. I think what I will do is write out of modified version of the check list - we don't strictly adhere to the expedition style race equipment - and publish it here. Then I can reprint and have a new copy for each trip. 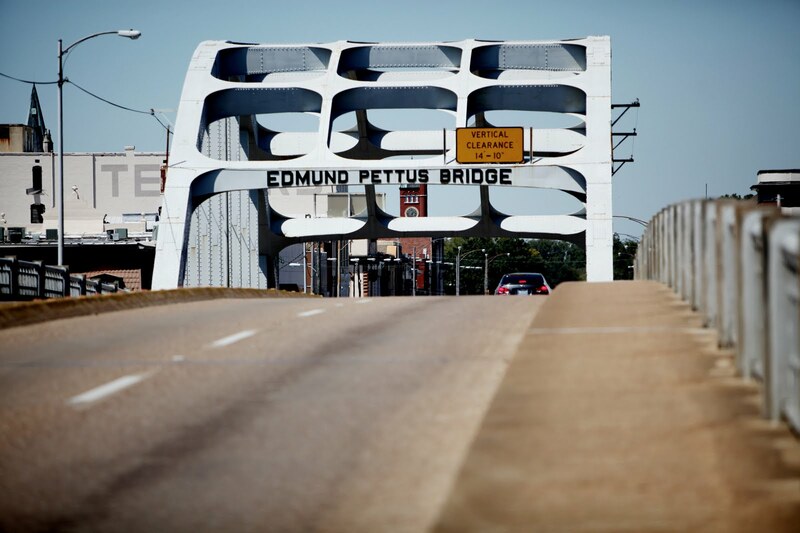 The Edmund Pettus Bridge today. 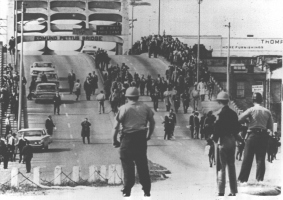 In 1965 it was the sight of Bloody Sunday. I may have solved a small, but annoying, mystery the other day. While checking over the fishing gear for the upcoming cruise I replaced the 20 lb. test braided nylon that serves as fishing line on the trolling rod. The existing braided nylon on the reel was a few years old, plus I had lost quite a bit of it over the years due to snags, cutting the line, etc. I spent $12 for 150 yards of new material. 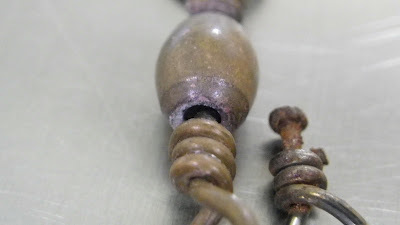 As I retied the swivel on the line I noticed excessive wear where the upper fitting goes into the barrel. You can see the irregular shape and corrosion around of the hole in the the barrel on the left, below. That excess where must come from the vibrating lure as it is trolled behind Spartina. And it could have been the excess wear that cost us a very nice fish on the Spring trip. To the right, above, is the upper fitting that pulled out of the swivel on day one as I fought a nice sized fish last May sailing from Onancock to Tangier Island. (Yes, I saved the broken fitting. Any fisherman that wants to tell the tale of line streaming off the reel, the drag screaming and Bruce jumping up out of an afternoon nap to say "What's that noise????!!!" 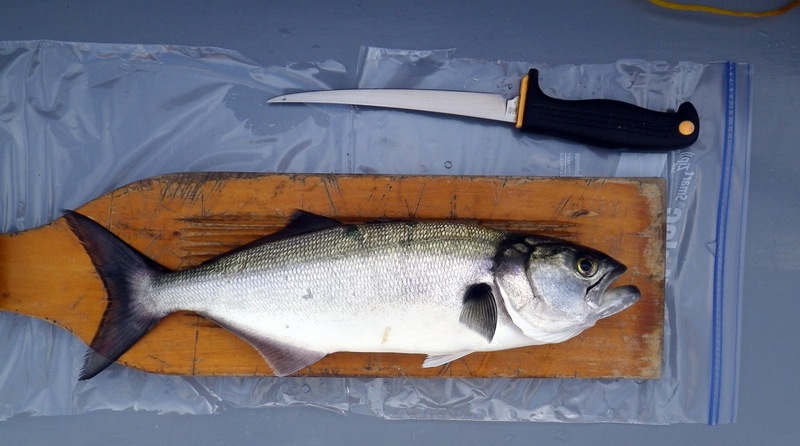 followed by a good rod-bending fight ending only with a broken fitting and a lost fish knows that he needs to save all the evidence at hand to back up that story.) I think the wear and tear of trolling led to the swivel failure. So now I've got new line and a new swivel. Plus I'll check the swivel each day before I start trolling. The good news is we had another swivel and lure aboard last Spring. 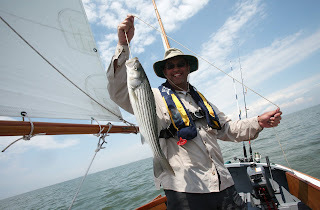 It worked very well the following day as Bruce brought in a nice striper off of Smith Island. Dinner was great that evening. Ok, fishing gear is in good shape. Now I need to start making lists of all the other little jobs I'll need to do once I'm back in town. Food supplies are in good shape, just need to buy the dried fruit and fresh vegetables. 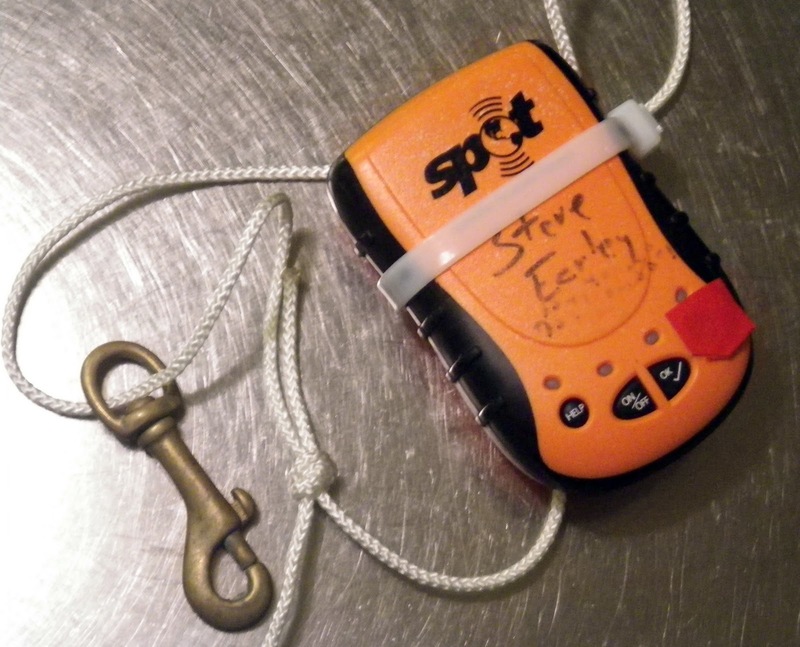 GPS, SPOT and vhf radio are in good shape, I do need to pick up some extra batteries. 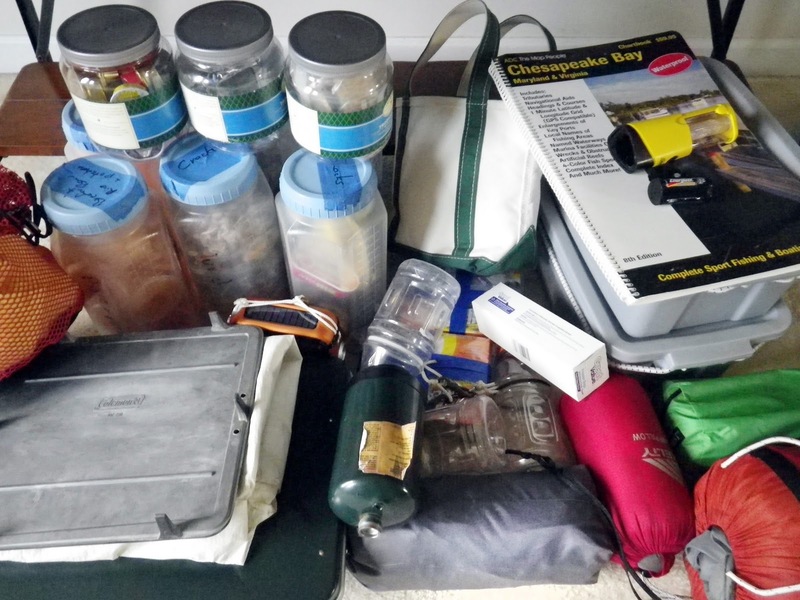 Clothes, hypothermia kit, water, charts, books, note books......lots of little details that need to be taken care of before I can cast off. I started my trip to the Deep South with a flight north. 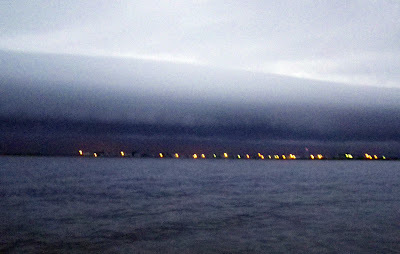 Clouds covered much of Chesapeake Bay, offering just glimpses of theYork River and Gwynn's Island in the early morning light. 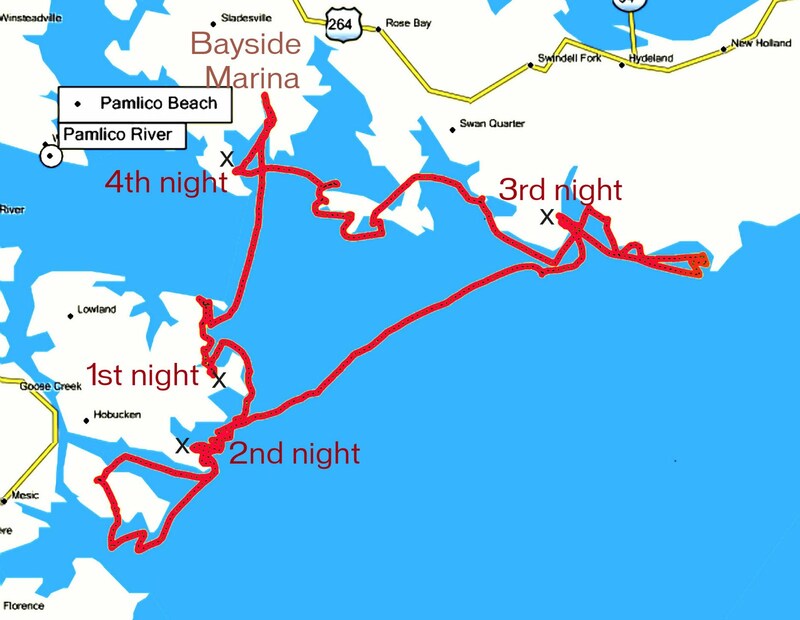 I saw a few lights at Reedville and thought of Tangier Sound just to east across the Bay. I'll be sailing up there in a couple of weeks. Light rain and fog in Baltimore, a bite to eat and then a flight south to Birmingham, Alabama. Another hour and a half on the road and we arrived in Montgomery. 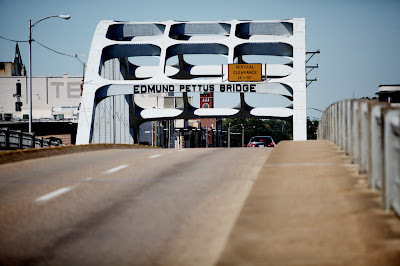 This small city on the a bend of the Alabama River, I was told shortly after arriving, is both the cradle of the confederacy and the cradle of the civil rights movement. The signs of each are everywhere. 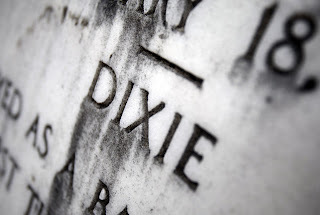 Above is a marker on Dexter Avenue near the state house explaining that Jefferson Davis had his inaugural parade up the street and during the parade "Dixie" was performed as a "piece" for the first time. Just across the street from that marker is the Dexter Avenue King Memorial Baptist Church. Martin Luther King, jr. was pastor there from 1954 until 1960. 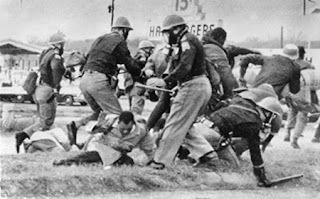 It was in the basement of the church he helped organize the bus boycott in the late 1950's. 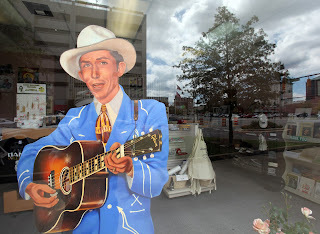 As for southern culture, don't forget Hank Williams (he has a museum here). 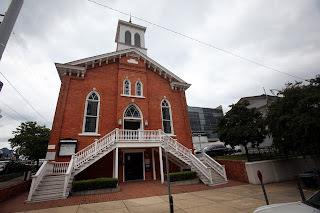 Or Rosa Parks (she has a museum here). Or F. Scott Fitzgerald (he has a museum here). Or the Montgomery Biscuits (minor league baseball team). I think I will learn quite a bit about the south over the next few days.